This is a list of recommended Personal traits. Some of them are for free, some are available via Infinity Lockbox or Exchange. You get a personal bonus depending on your teammates profession. Each of the bonuses can stack up to 5 times. Only allies within 20km contribute. Science Fleet now provides a shield regeneration effect during its uptime as an addition to existing effects. 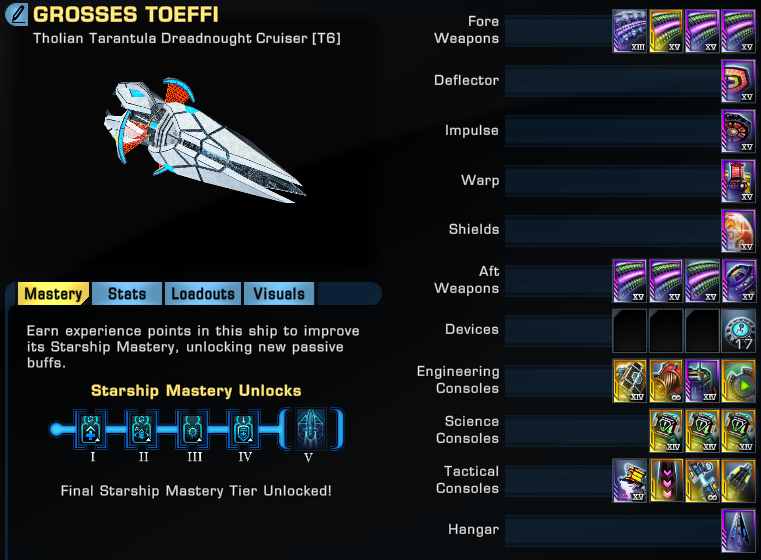 Engineering Fleet now provides a hull heal-over-time to players affected by your Engineering Fleet. 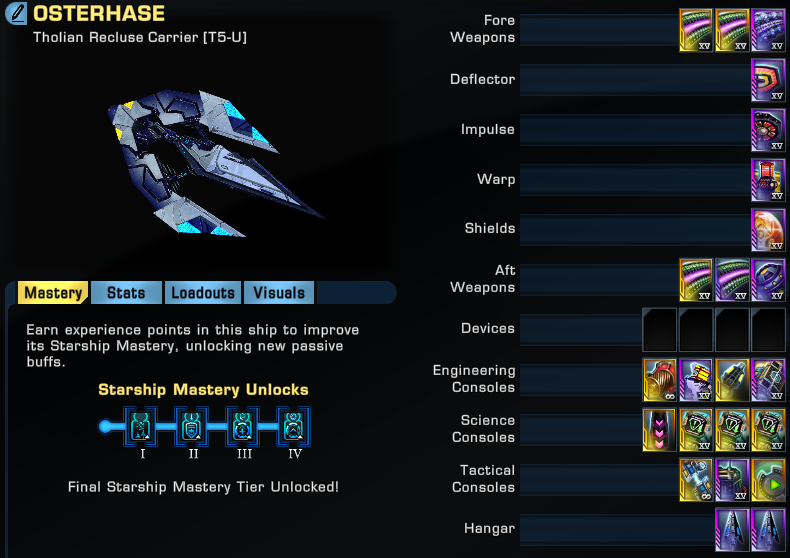 Tactical Fleet now improves your and your team’s ships maneuverability. Improves your outgoing hull healing and makes your ship a more attractive target for enemies. Chance to increase your skills. Improves your outgoing shield heals. 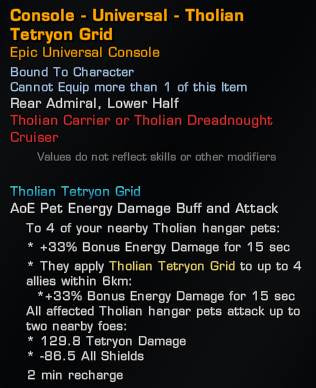 Sadly we don’t have support traits here, so we use defensive traits for our own ship. Gives you +12.5 Bonus All Damage Resistance Rating in space combat. The fewer hitpoints you have the more Damage Resistance Rating you get. +0-93,75 All Damage Resistance rating bonus depending on your current hitpoints. 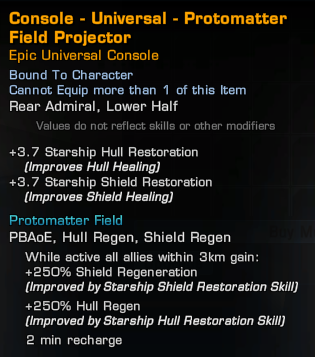 Hull heals when firing energy weapons. 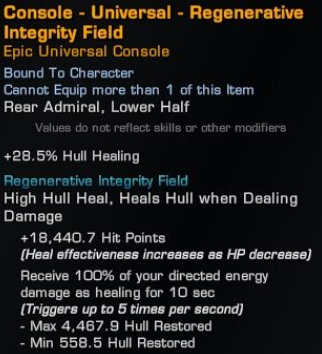 You receive 9.4% of your outgoing damage as a Hull heal to you. Triggers up to 5 times, capped at 450 base healing per trigger. Reduces the recharge time of your Bridge Officer abilities. 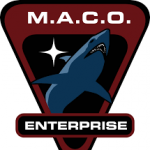 Increases your ships base flight speed and turn rate. 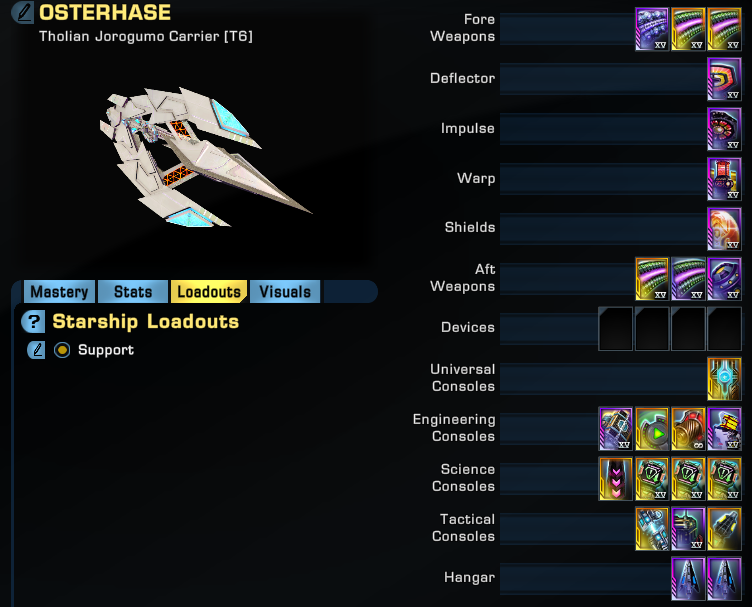 We recommend the following traits for a support ship. 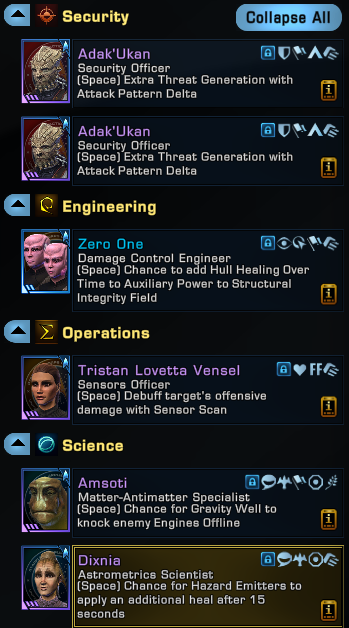 science bridge officer and captain abilities. to debuff enemies resistance rating. Activating Science, Engineering or Tactical Team will apply a lesser version of it to self and allies within 10km. 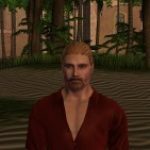 will reduce weapon cost reduction for yourself and near allies. We want to use weapons with a Damage Resistance Debuff. 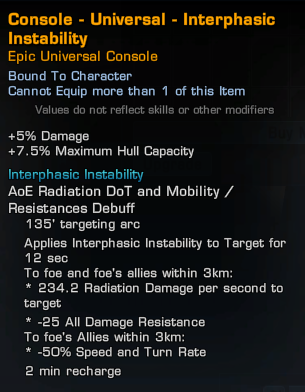 For this Disruptor beams are the best choice because they have a Damage Resistance Debuff as a Proc. We recommend two different beams. 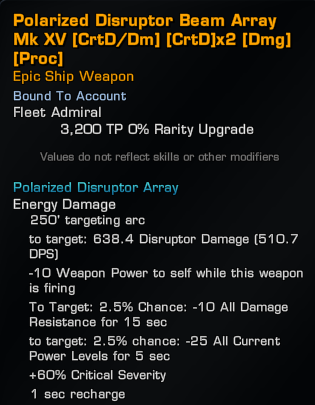 If the player you support uses different energy weapon types, you should use Polarized-Disruptors. 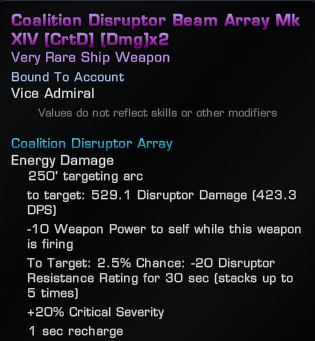 If the player you support uses only disruptor beams, you could use Coalition Beams because of the strong debuff. You can also use this Omni-Directional beam. It doesn’t matter if you use Phaser or Polaron. We use this weapon because of the damage resistance debuff. 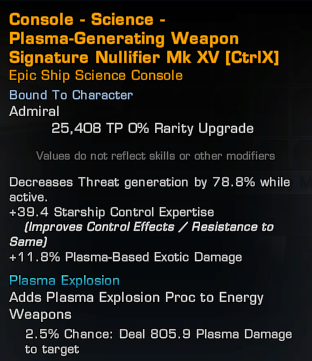 You can get this weapon via the Gamma Reputation. As an additional weapon, you can also use this one. 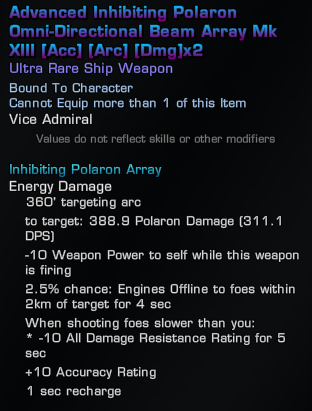 This weapon wasavailable during the Crystalline Catastrophe Event during September 2018. The Iconian 4-pc set is still the best choice for a support build. We use this one because of the 3-pc and 4-pc set boni. The 3-pc is a passive proc, the 4-pc has to be activated manually. Now we want to have a look at the consoles. We want to use consoles which buffs our heal, debuff and control abilities. This console offers you a very usefull heal for yourself and your allies. You can use this console on yourself or an ally. When using the ability, it is important to stay close to the allied target at all times. 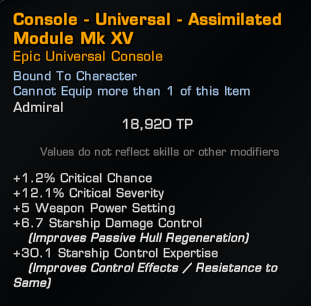 This console also provides a passive bonus to your hull restoration and capacity. 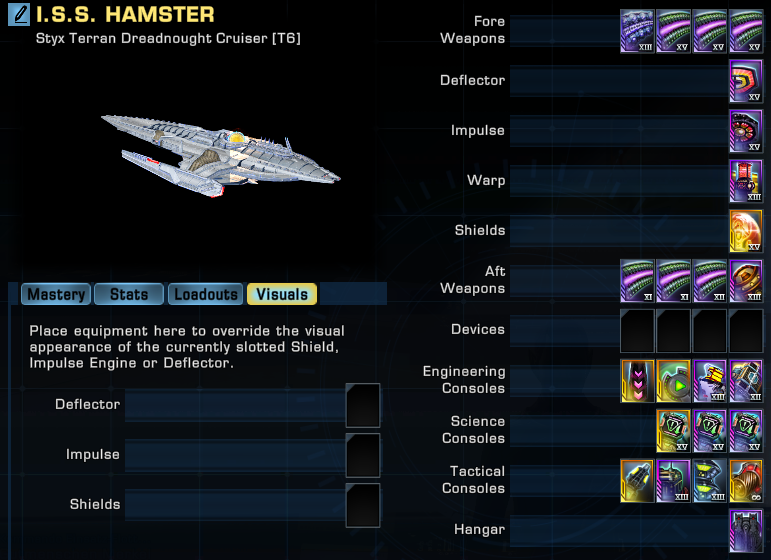 The console establish a energy link between your ship and your hangar pets. The grid can be extend to nearby allies within 6km and increases their energy weapon damage. It is important that all hangar pets are active and they should be around the primary target. 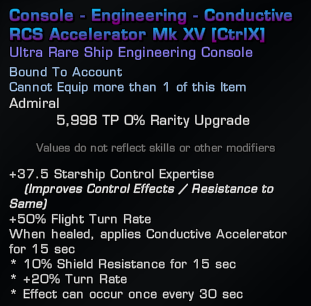 This console can only be used on the Tholian Recluse Carrier and the Tholian Tarantula Dreadnought Carrier. 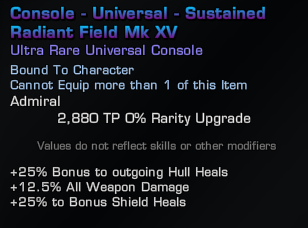 This console enhances your weapon damage and, more important for a supporter, gives you bonuses to your outgoing Hull Heals and your Shield Heals. This console provides you a very strong PBAoE Heal for yourself and nearby allies. Use this console when your ally is under heavy fire. This consoles helps you to debuff. You should use this console on a big target (e.g. Tac Cube), maybe in combination with a Gravity Well. We use this console to buff the Gravity Well. You should use as many of these console as possible. The Recluse is a pretty slow turning ship, this one is very usefull. This very cheap console also buffs Control Abilities. Very good console for more heals. 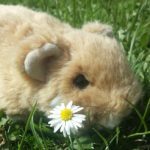 We use these pets for the Recluse and Tarantula. 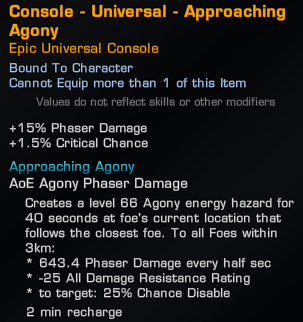 You can buy them in a T5 Starbase. 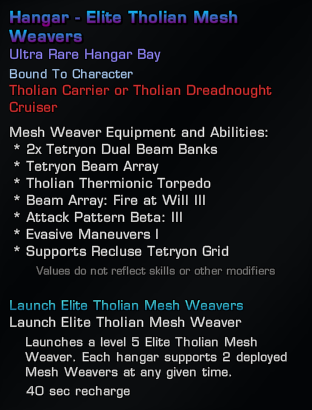 The Elite Tholian Mesh Weavers use Attack Pattern Beta III and help use to debuff the enemy. With Fire at Will III they spread their debuff all over the map. 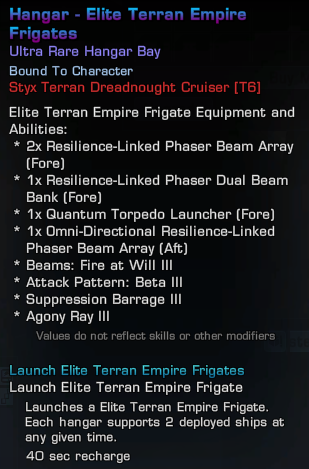 If you use the Terran Styx Dreadnought instead, you should use the Terran Empire Frigates. They also use Beta III and Fire at Will III and as an addition, they also use Supression Barrage. This is a list of the Duty officers you can use on a support ships. The layout depends on which ship you use and if you use A2B or not. 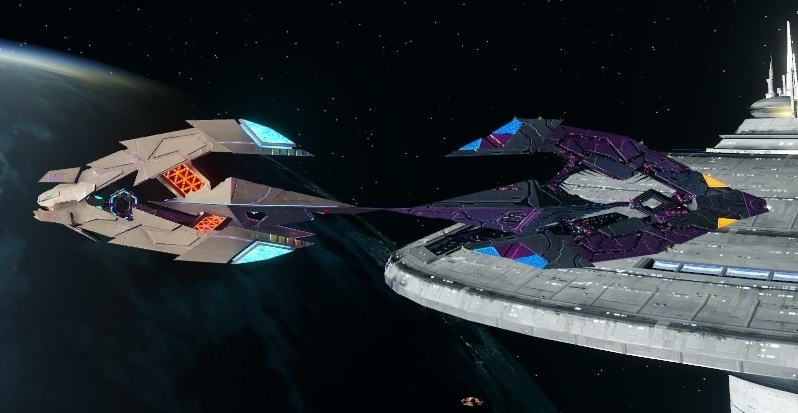 This lovely Jem’Hadar increases the threat generation for the target of your Attack Pattern Delta. You can slot up to 3 of them. This trait helps your ally to get more stacks of Attack Pattern Delta Prime. This duty officer has the chance to add an extra heal to Hazard Emitter. 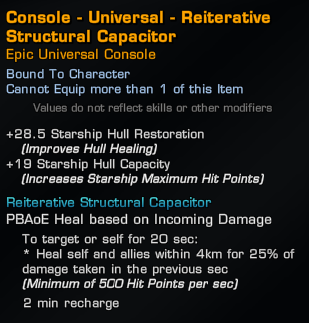 This duty officers can add a Hull Heal over Time to your Aux2Sif. If you don’t use Aux2Sif on your ship, you don’t need this officer. 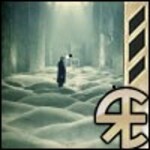 This duty officer adds a chance for your Gravity Well to deactivate enemy engines for a short time. Very useful on spheres. Stops escape attempts. Very helpful against angry spheres. Of course only useful for science supporters. Only use them when you fly an Aux2Bat ship. You can use up to 3 of them. We have two bridge officers with usefull skills. 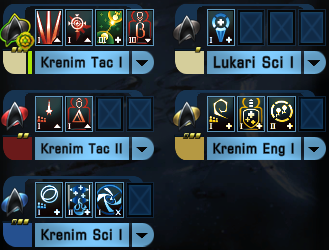 You should use one Lukari BO and if you don’t use A2B, you can also use Krenim BOs. This is the special trait offered by the Lukari. 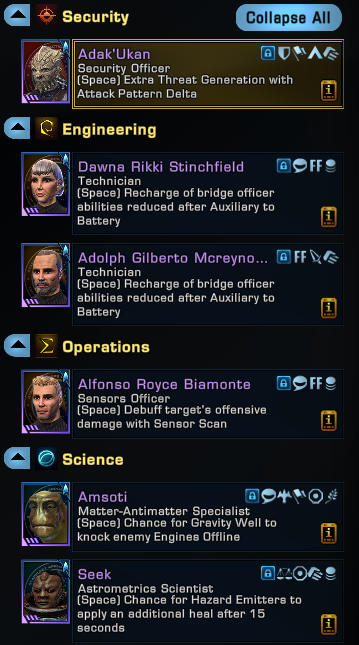 You can get Lukari BOs on a T4 Colony. 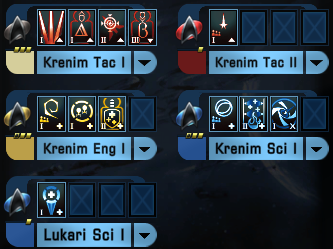 If you don’t use A2B or you have too much dilithium, you can use Krenim BOs. This one is a science BO, but there are also engineering and tactical ones. You can buy them at the Fleet Research Lab. If you don’t run Aux2Bat, you should use two Krenim Tacs to reduce the cooldown of Beam: Fire at Will. Because we want to use Intelligence Fleet II. This ability provides a teamwide shield and armor penetration enhancement for 30 seconds. Miracle Worker helps to improve your heal abilities. Energy Refrequencer at Rank 2 gives 3.1% , not 9.4%. Energy refrequencer 2 is now capped at how much hull per instance? Is it worth slotting? Very interesting work. Is there also a niche for support types that focus on buffing team damage instead of debuffing the enemy? There’s also Form Up, but you need a ship with a pilot BO for that. 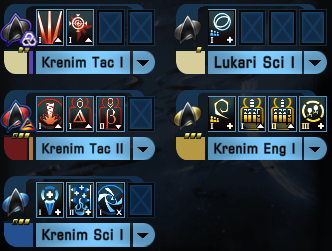 Are fed science captains still the best support toons? 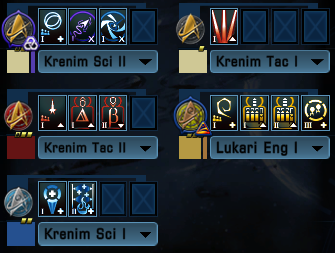 No, you can take a take a KDF or Rom as well, it should only be a science alien to have 10 traitslots available. KDF are cheaper than FED at the moment, because the trait Superior Area Denial can easily be bought at the exchange exchange and you don’t have to spend 400 million on a ship. But it doesn’t make any difference which faction the character is. Kewl. 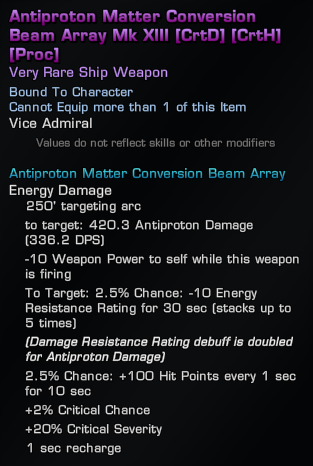 An excuse to make a KDF Science captain! Alien KDF Science captain, that is.